Joint venture partners Pellicano and Perri Projects have announced $190m in sales across the first three buildings at the $600m masterplanned Woolloongabba precinct, South City Square. The precinct is set to deliver one of the largest mixed-use sites in Brisbane, utilising around 5000sqm of publicly-accessible ground. It is the product of collaboration between DBI Design, Woods Bagot, Six Degrees Architects and Oculus. Perri Projects’ Managing Director David Scalzo said the intention of South City Sqaure is to deliver a liveable and productive and community which is sustainable in the long term. “Woolloongabba has undergone a period of intense gentrification in recent years and South City Square is set to become a key part of this process,” he said. When complete, the precinct will feature seven architecturally designed buildings – six residential towers and one 5-star hotel. Each building in the series of distinctive residential towers will boast contemporary apartments, rooftop amenity and views over Brisbane. 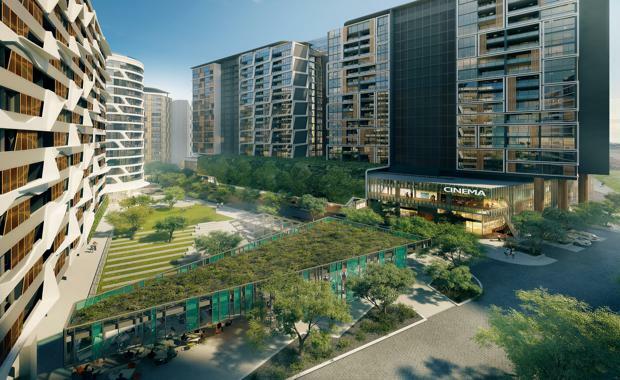 The masterplan for the site also includes provisions for more than 13,000sqm of retail including a full-line supermarket, 8-screen boutique cinema, a medical centre, health and wellness precinct, childcare centre, central marketplace, cafés, restaurants and underground parking. In addition to creating parking for residents, the masterplan will also cater for a significant number of underground public and private parks to service the residential buildings, supermarket and key retail offerings, with a total of approximately 1,500 basement car spaces set to be delivered. South City Square is located on the corner of Logan Road and Deshon Street, positioned a short walk from the Gabba and a seven-minute drive from the CBD, while also surrounded by a number of different transport options. South City Square will provide homes for over 2000 residents once it reaches its projected completion in 2022.